Uber To Lose License In London: Service Is 'Not Fit And Proper,' City Says : The Two-Way Transport for London's problems with Uber include its "approach to reporting serious criminal offences" and how it handles background checks. Uber plans to appeal the decision denying it a new five-year license to operate in London. 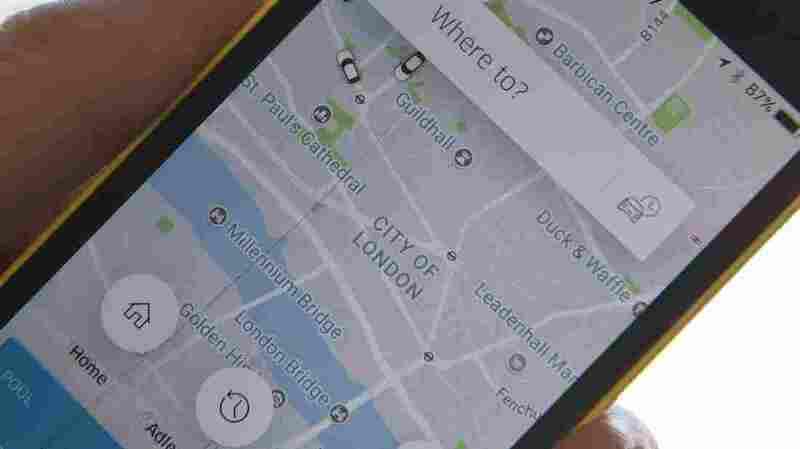 Uber's license to operate in London expires in eight days — and London's transportation agency says it won't be renewed, citing a range of problems that make the company "not fit and proper to hold a private hire operator licence." The issues raised by Transport for London include Uber's "approach to reporting serious criminal offences" and how it handles background checks. Uber says it will appeal the decision. Transport for London had been considering granting Uber a five-year license. The company was first licensed in London in 2012. Responding to the denial to renew its license, Uber in London General Manager Tom Elvidge says city regulators "caved in to a small number of people who want to restrict consumer choice," adding, "If this decision stands, it will put more than 40,000 licensed drivers out of work and deprive Londoners of a convenient and affordable form of transport." In a statement about its decision, London's transport agency also mentioned Greyball, software that can block access to chosen users of the company's app by presenting only a limited view within the standard app — an ability that critics say the company used to thwart government regulators and law enforcement. Greyball was exposed in March by The New York Times, which reported that it was used to allow drivers to find customers in cities where the app had been banned. Responding to a surge of interest, Uber said it would prohibit use of the software "to target action by local regulators going forward" — but the company also said it would "take some time" for that to be fully enforced. Taking exception to the mention of Grebyball, Uber's Elvidge said Friday, "As we have already told TfL, an independent review has found that 'greyball' has never been used or considered in the UK for the purposes cited by TfL." Uber has 21 days in which it can appeal Transport for London's decision. The company can continue to operate in London while an appeal is ongoing. The company says its app has 3.5 million users in the city. The decision has touched off a public debate, with London's Mayor Sadiq Khan saying he backs the move. "Providing an innovative service must not be at the expense of customer safety and security," Khan said. He added, "Any operator of private hire services in London needs to play by the rules." But others say the city's government has catered to its entrenched cab industry. "The only people that will benefit are the Black Cab lobby who have crushed a competitor through cronyism, rather than providing a better service," said Sam Dumitriu, an economist at the Adam Smith Institute. Uber operates in more than 600 cities around the world — but the app is currently blocked from in a wide range of cities, including Vancouver, Canada. And despite its famously aggressive growth, Uber has been forced to leave large markets to rivals in Russia and China. It also pulled out of Denmark, after a new law required taxi meters and cameras to be installed in cars. Uber has faced criticisms and controversy on a number of fronts this year, from the behavior of co-founder Travis Kalanick — who resigned as CEO in June — to sexual harassment and other workplace-misconduct claims that led to the firing of about 20 employees, including some senior executives. Despite those troubles, the privately held Uber's value was calculated at nearly $70 billion earlier this year.